Define and solve models for studying systems containing fluid flow and fluid flow coupled to other physical phenomena with the CFD Module, an add-on product to the COMSOL Multiphysics® simulation platform. These capabilities are implemented through structured fluid flow interfaces in order to define, solve, and analyze time-dependent (transient) and steady-state flow problems in 2D, 2D axisymmetry, and 3D. 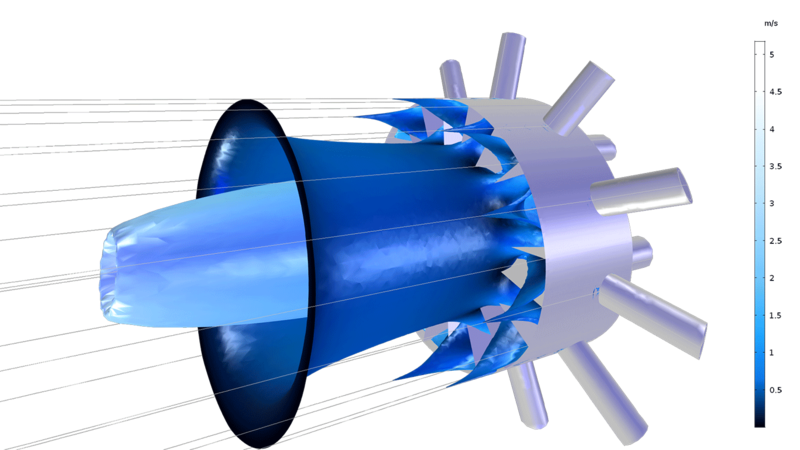 In addition to the list above, the CFD Module includes tailored functionality for solving problems that include non-Newtonian fluids, rotating machinery, and high Mach number flow. The ability to implement multiphysics in a model is important for fluid flow analyses. 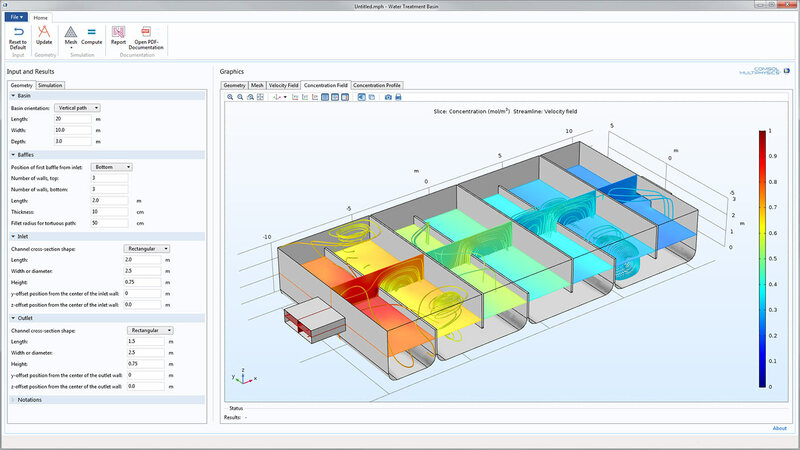 With the CFD Module, you can model conjugate heat transfer and reacting flows in the same software environment you use to analyze fluid flow problems — simultaneously. Additional multiphysics possibilities, such as fluid-structure interaction, are available when combined with other modules within the COMSOL® product suite. When you expand COMSOL Multiphysics® with the CFD Module, you have access to features for specialized CFD simulations in addition to the core functionality of the COMSOL Multiphysics® software platform. All of the features listed below are implemented through associated physics interfaces. 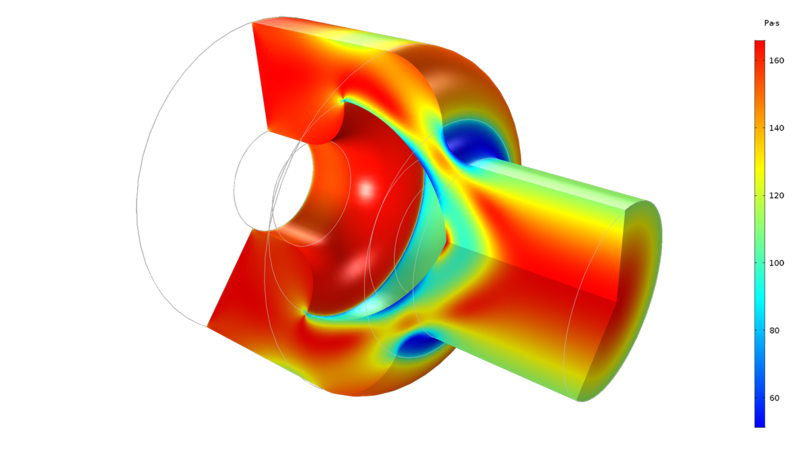 When defining and solving these problems, the fluid is modeled as incompressible by default but can be interchanged with weakly compressible or fully compressible flow simply by choosing them from a list. The Laminar Flow and Creeping Flow interfaces provide you with the functionality for modeling transient and steady flows at relatively low Reynolds numbers. A fluid viscosity may be dependent on the local composition and temperature or any other field that is modeled in combination with fluid flow. For non-Newtonian fluids, you can use the predefined rheology models for viscosity, such as Power Law, Carreau, and Bingham for easy model setup. In general, density, viscosity, and momentum sources can be arbitrary functions of temperature, composition, shear rate, and any other dependent variable, as well as derivatives of dependent variables. These settings make it possible to define arbitrary models for viscoelastic flow. Shear-rate-dependent viscosity on the flow of a linear polystyrene solution injected through a nozzle, simulated using the non-Newtonian Carreau model. Change or extend the model equations directly in the graphical user interface (GUI) to create turbulence models that are not yet included. To describe flows in thin domains, such as the thin oil films between moving mechanical parts or fractured structures, the CFD Module provides the Thin Film Flow, Shell interface. This formulation is typically used for modeling lubrication, elastohydrodynamics, or the effects of fluid damping between moving parts due to the presence of gases or liquids (for example, in MEMS). The Thin Film Flow, Shell interface formulates and solves the Reynolds equation for flow in narrow structures and formulates the mass and momentum balances using a function for the flow averaged across the thickness of the thin structure, which implies that the thickness does not have to be meshed. This functionality helps avoid meshing problems across the gap and thereby saves computation time. Pressure and flow in a thin liquid film in a tilted pad bearing. The deformation of the solid structure due to the flow and pressure is shown and multiplied by a factor of around 4000. In separated multiphase flow systems, you can use surface tracking methods to model and simulate the behavior of bubbles and droplets in detail, as well as free surfaces. 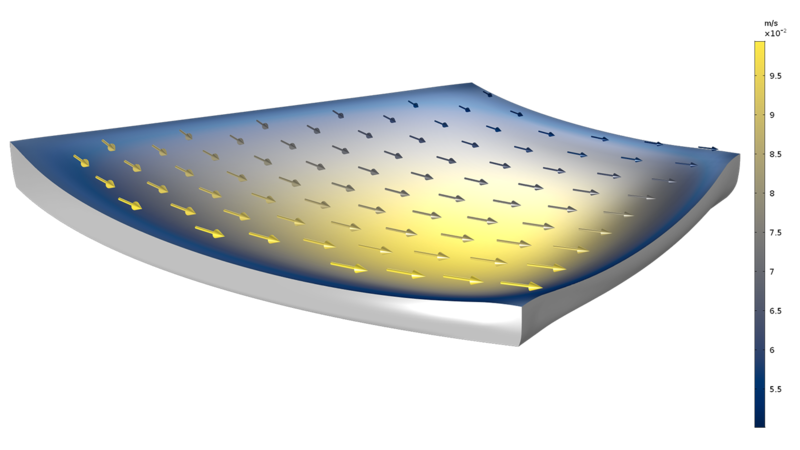 For such cases, the shape of the phase boundary can be described in detail, including surface tension effects, using surface tracking techniques for separated multiphase flow. When bubbles, droplets, or particles are small compared to the computational domain and there is a large number of them, you can use dispersed multiphase flow models. These models keep track of the mass fraction of the different phases and the influence that the dispersed bubbles, droplets, or particles have on the transfer of momentum in the fluid in an averaged sense. A separated three-phase flow problem is modeled using the Three-Phase Flow, Phase Field interface. The CFD Module makes it simple to simulate fluid flow in porous media using three different porous media flow models. Model transonic and supersonic flows of compressible fluids in both laminar and turbulent regimes. The laminar flow model is typically used for low-pressure systems and automatically defines the equations for the momentum, mass, and energy balances for ideal gases. High Mach number flow is available for the k-ε and Spalart-Allmaras turbulence models. The COMSOL® software automatically formulates the energy equation coupled to the momentum and mass balance equations for ideal gases. In both cases, when meshing these models, automatic mesh refinement resolves the shock pattern by refining around the regions with very high velocity and pressure gradients. Shock diamonds in the velocity field of supersonic flow from an ejector are modeled using an interface for turbulent high Mach number flow. Rotating machines, such as mixers and pumps, are common in processes and equipment where fluid flow occurs. 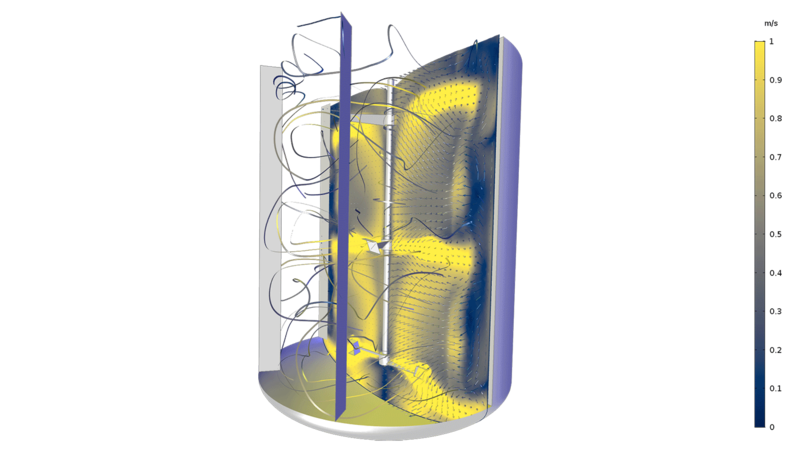 The CFD Module provides rotating machinery interfaces that formulate the fluid flow equations in rotating frames and are available for single-phase laminar and turbulent flow. Either define and solve problems using the full time-dependent description of the rotating system or use an averaged approach based on the frozen rotor approximation. This feature is computationally inexpensive and can be used to estimate averaged velocities, pressure changes, mixing levels, averaged temperature and concentration distributions, and more. Generally speaking, the CFD Module can also solve fluid flow problems on any moving frame, not just rotating frames. You can use moving frames to solve a problem where a structure slides in relation to another structure with fluid flow in between, which is easy to set up and solve by employing a moving mesh. Flow and pressure field in a centrifugal pump modeled using turbulent flow in rotating machinery. 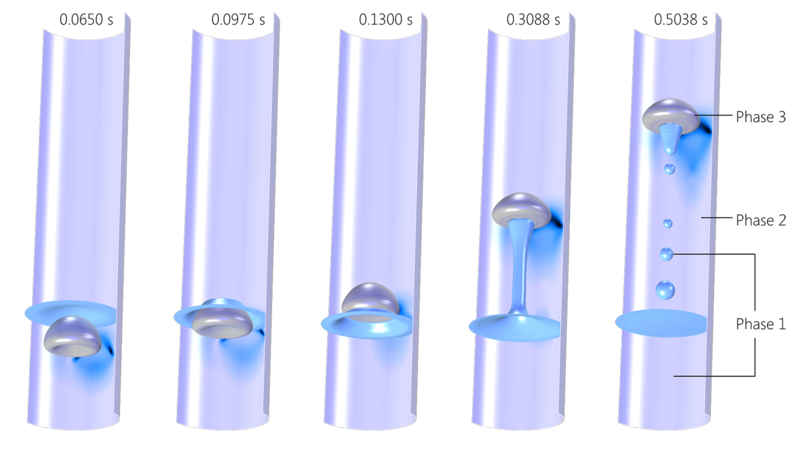 In many cases, fluid flow models are coupled to other phenomena, such as heat transfer, structural mechanics, chemical reactions, or electromagnetic fields in electrokinetic flow and magnetohydrodynamics. Modeling multiple physics phenomena in COMSOL Multiphysics® is no different than a single-physics problem, as the CFD Module provides ready-made multiphysics interfaces for the common couplings. The CFD Module provides a dedicated physics interface for defining models of heat transfer in fluid and solid domains coupled to fluid flow in the fluid domain. These types of models are denoted conjugate heat transfer models, which implies that the fluid flow equations are defined and solved in the fluid domain, while the heat transfer equations are formulated and solved in both the solid and fluid domains. For laminar flows and turbulence models using the low-Reynolds-number wall treatment, the temperature is continuous across the solid-fluid internal boundary, which is the default setting in the nonisothermal flow interfaces. To simulate turbulent conjugate heat transfer using turbulence models with wall functions, the Nonisothermal Flow interface automatically defines thermal wall functions. The options of low-Re formulations and thermal wall functions make it very straightforward to define and solve conjugate heat transfer problems in combination with turbulent flow. The two-way coupling defines a moving mesh problem in the fluid domain. The displacements at the solid-fluid surfaces are determined by the balance of forces exerted by the fluid and counterforces exerted by the deforming solid structure. Steady-state and time-dependent studies are available for both one-way and two-way FSI problems for laminar and turbulent flows. You can use the CFD Module to model reacting systems for both turbulent and laminar flows. This allows for the study and design of reactors, mixers, and any other system where chemical reactions and flow occur. The reacting flow interfaces are able to describe multicomponent transport in diluted and concentrated mixtures. The mixture-average model for multicomponent transport is used for concentrated solutions. The full Maxwell-Stefan multicomponent transport equations are available in combination with the Chemical Reaction Engineering Module. For turbulent reacting flows, the eddy dissipation model is used to describe turbulence fluctuations in the reaction terms for both diluted and concentrated solutions. To simulate multicomponent transport in concentrated mixtures, the Stefan term is also automatically taken into account; for example, at reacting boundaries. The isoconcentration surfaces of a reactant in a multijet injection reactor are modeled using the Turbulent Reacting Flow interface. The Mixer Module expands the capabilities of the CFD Module by adding multiphase flow and free surfaces for rotating machinery. Additionally, you can access a Part Library for impellers and vessels to streamline geometry creation. Both of these features are well suited for modeling processes in the pharmaceutical and food industries. 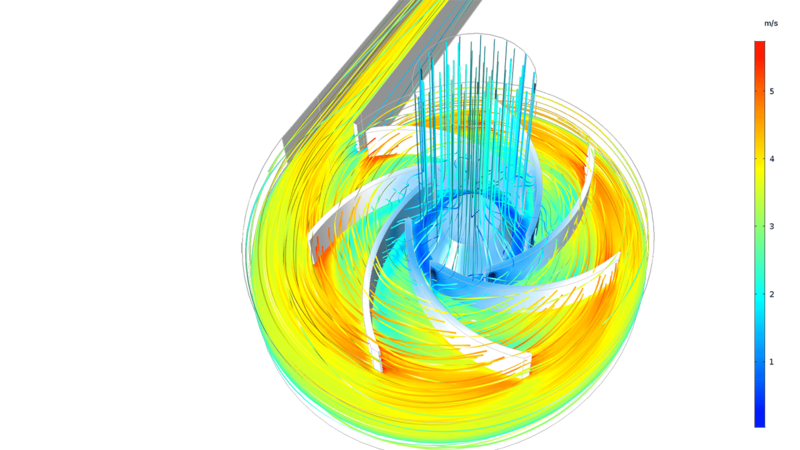 A mixer equipped with three impellers is modeled to show the flow pattern and shape of the free surface. The multiphase flow interfaces for dispersed flow in the CFD Module treat the dispersed phase as a field where its volume fraction is a model variable. 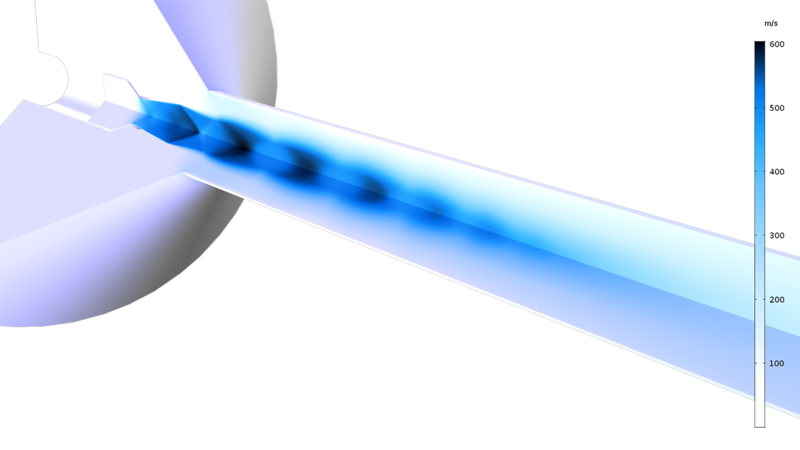 When combined with the Particle Tracing Module, you can use the CFD Module to model Euler-Lagrange multiphase flow models, where particles or droplets are modeled as rigid particles. With rigid particles modeled separately, the interaction between the fluid and the particles is bidirectional, where the particles affect the fluid flow as well. In addition, the Euler-Lagrange models are computationally inexpensive when studying a relatively small volume fraction of particles. The Pipe Flow Module defines models for networks of pipes and channels where the fluid flow equations can be solved along lines and curves. 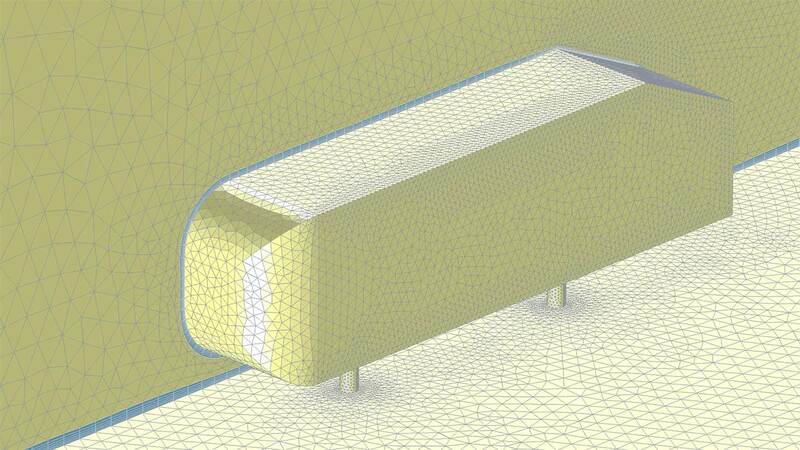 By combining this product with the CFD Module, you can create high-fidelity simulations that include pipes and channels connecting to 2D or 3D fluid domains with incompressible, weakly compressible, nonisothermal, and reacting flows. Generate flow domains, such as a bounding box, around imported CAD geometries. You can automatically or manually remove details included in a CAD representation that are not relevant for fluid flow. The CFD Module includes a Material Library with the most common gases and liquids. In combination with the Chemical Reaction Engineering Module, you can also access generic descriptions for physical properties of gases (such as viscosity, density, diffusivities, and thermal conductivity). The physics-controlled mesh functionality in the CFD Module accounts for boundary conditions in fluid flow problems in order to compute accurate solutions. A boundary layer mesh is automatically generated in order to resolve the gradients in velocity that usually arise at the surfaces where wall conditions are applied. 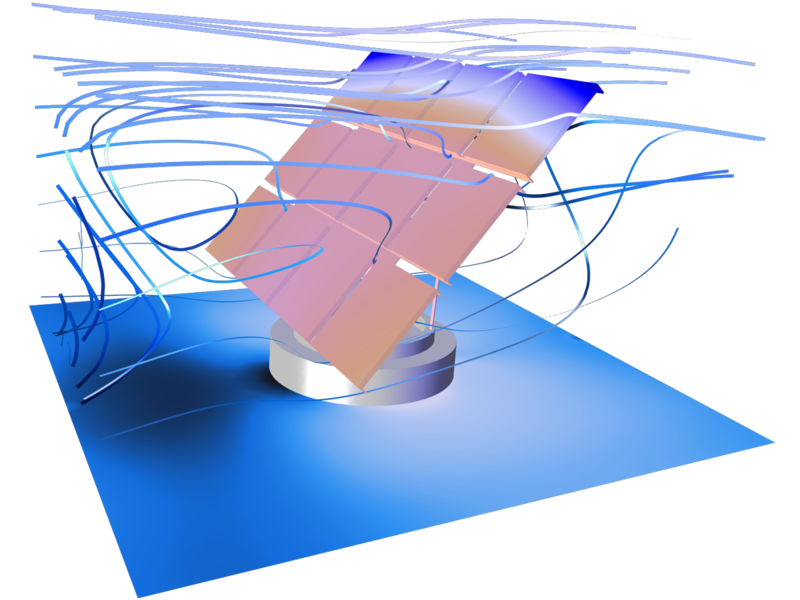 The fluid flow physics interfaces use a Galerkin least-squares method to discretize the flow equations and generate the numerical model in space (2D, 2D axisymmetry, and 3D). The test function is designed to stabilize the hyperbolic terms and the pressure term in the transport equations. Shock-capturing techniques further reduce spurious oscillations. Additionally, discontinuous Galerkin formulations are used to conserve momentum, mass, and energy over internal and external boundaries. The flow equations are usually highly nonlinear. In order to solve the numerical model equations, the automatic solver settings select a suitable damped Newton method. For large problems, the linear iterations in the Newton method are accelerated by state-of-the-art algebraic multigrid or geometric multigrid methods specifically designed for transport problems. For transient problems, time-stepping techniques with automatic time stepping and automatic polynomial orders are used to resolve the velocity and pressure fields with the highest possible accuracy, in combination with the aforementioned nonlinear solvers. The fluid flow interfaces generate a number of default plots to analyze the velocity and pressure fields. There is an extensive list of derived values and variables that can be easily accessed to extract analytical results. A benchmark CFD model of an Ahmed body. The boundary layer mesh at the wall surfaces is highlighted in blue. Adaptive mesh refinement in time. 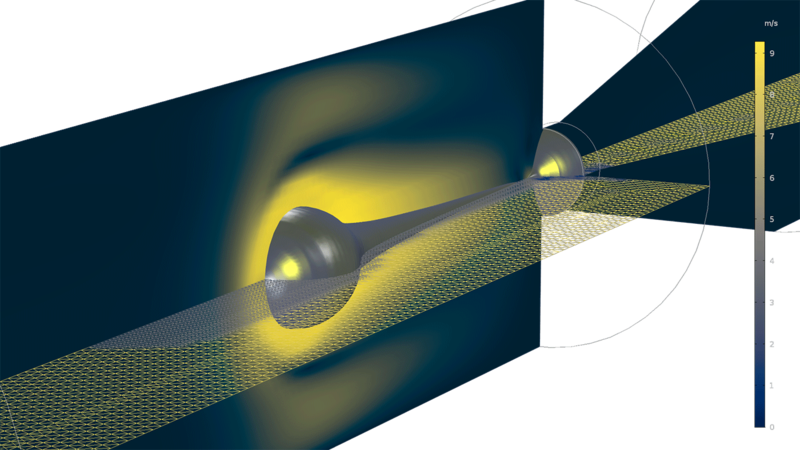 The phase boundary around an inkjet droplet (gray isosurface) and in the projected immediate path of the droplet are refined with a denser mesh to obtain a sharp phase boundary between the droplet and air. The Water Treatment Basin app demonstrates the use of parameterized geometry sequences; cumulative selection for the automatic definition of boundary conditions; and the building of graphical user interfaces for easy-to-use, tailored apps.